I know you all want to see the swag and goodies I got at Sewing Summit so I'm just going to put that up front and save you all that work scrolling down. :) There are a couple of things missing from this pic since the second box I shipped from Sewing Summit hadn't arrived when I took this, but you get the general idea! Pretty cool, huh? I left at the crack of dawn on Thursday for Utah! I was sleepy but excited! I met Elizabeth at the airport in Dallas where we were making a connection to SLC. It was so great to finally meet her in person!!!! Amy (Sukie Sukie to me) picked us up and took us to the hotel to drop off our stuff and then a few of us late stragglers (who missed the Shop Hop bus) hopped in Amy's car for lunch and a shop hop of our own! This is Faith, Lee, me, and Terri acting like total dorks at a crosswalk. The flags are supposed to make you more visible to cars, but frankly I think the flags are to make tourists look like idiots for the amusement of the locals. 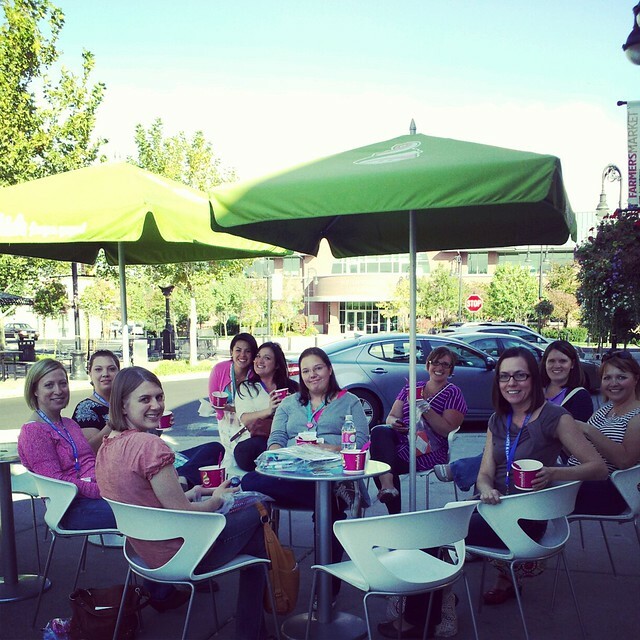 After shopping we met up with some other ladies for frozen yogurt. My good friend, Elena, and me at the Craftsy mixer the Thursday night. I have to say, I was a bit surprised by how many people knew my name/blog name. I felt a bit like a unknown going into this since I was a fill in teacher, but I had a lot of people recognize me. Weird! Have I mentioned that my roommate, Terri, is the BEST roomie ever?!?!?!? She brought me this bundle of Anna Maria Horner goodness because she knows my obsession. So very sweet of her! We decided to room together before we even knew each other and it couldn't have worked out better! Terri is one of the sweetest people I've met! As I said before, I was a fill-in teacher for my good friend, Michelle. Well, Michelle, being the thoughtful, talented person she is, made Elena, Ali, and me pillow cases to use at the hotel and had them sent ahead for us. We were all SO SO SO excited! She made each one unique for our own style, we didn't even need the labels to know which one belonged to us! The most exciting thing that happened the first night was meeting this little guy. I was innocently drying my hair when I felt something on my foot. I looked down to see a bug of some kind. I shook it off and looked a bit closer only to realize it was a SCORPION!!! Yes, you read that correctly, a SCORPION! Commence cursing and squealing like a little girl. I called the front desk to request someone come up and kill the evil thing. After the operator freaked out a bit, she sent up a manager and a security guy. They didn't seem to believe me at first, but I showed them the eight-legged thing I trapped under a glass and the reply was, "Well I'll be damned! It IS a scorpion!" Uh huh. Kill it now, please! The first day of classes kicked off with my first go at teaching a large group. The teaching itself went well, but I discovered at the end of class that half of the students had the wrong sized template and their pouch was too small to fit into the metal frames! I wanted to cry! Some of them had used the template copies I brought and some had printed at home, but when they were copied they must have been slightly shrunk. I was so sick to my stomach over this! It was all my fault! I copied the template the night before I left and I never thought to compare it to the original. For any of you in my first class, I'm so so so so so sorry! Thankfully, I had my originals and the next two classes made sure their fabric was cut the correct size. Lots of people went home with a completed pouch and the confidence to make more so, mission accomplished! I did end up with a bit of tendonitis in my wrist after helping so many people glue their pouch in the frame! LOL! Jeni's color class was awesome and we all got color cards from Michael Miller! Me, Elena, and Terri hanging out before the SLCMQG mixer. Love these girls! My mini from Christina's curves class! I didn't get a picture of Kati and Faith's Shapes and Angles class, but that one was my fav. So many great little tips and tricks for me to use! Got to hear Joel Dewberry and see his new collection, Notting Hill. Final morning breakfast with a lot of my favorite people! The three musketeers, Ali, Elena, and me. My sister in law, brother in law, and nephew live in SLC so I stayed an extra day to hang out with them. Isn't he the cutest?!?!? Yes, this is the infamous Ezra Stegosaurs (for real, that's his name). I fell a bit in love with Fall in Utah! I may blow this picture up and hang it in my house! I made my brother in law stop in the middle of a street for me to take this one! The light was amazing! I participated in Amy's bunting swap (I made a Mendocino one) and this is the one I got! I love it! Jeni made it from vintage sheets and it's so colorful and the perfect addition to my mini quilt wall! My sew-fantastic roomie, Terri, made me this Bohemian one so I wouldn't have to fight for it in the bunting swap (she made a second one for the swap). So there you have it! My Sewing Summit recap! There was obviously a lot I left out, but with all the blog posts going up I'm sure you can fill in the blanks! :) I had such a great time and I can't wait for next year! Whether I go as a teacher (puh-lease Erin!) or just an attendee, I know I want to be a part of it! HAHAHAHA! 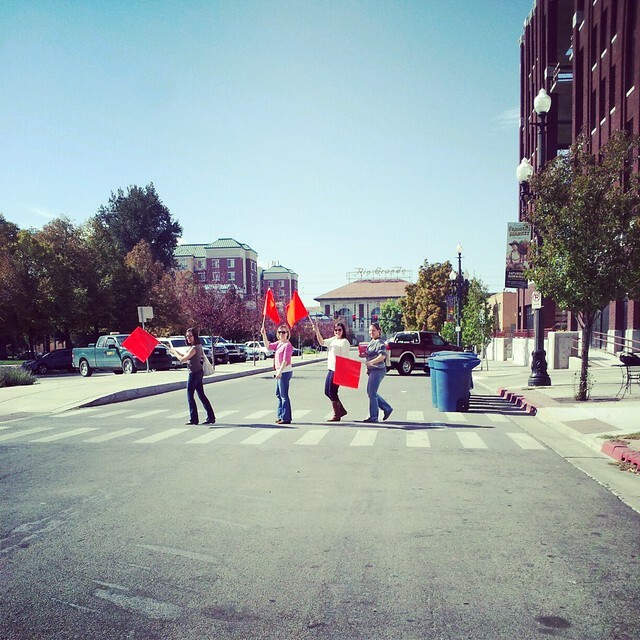 LOVED the photo of your "flag walk" across the street. Your caption was great, as well. So glad you had a wonderful weekend! Wish I could have been there! As an older (age) blogger, I was curious to know what age range attended this. From your pics, it looks like the younger generation. So glad to see you all sewing and quilting! Very fun! Thanks again for the frame purse class & setting me off on another obsession! After reading your post I really want to be there next year! I loved following along with your pics on IG, though I was seriously jealous I couldn't be there, too. :) I need to make it happen next year!! Fab post. Only where on earth did the scorpion come from? That would have freaked me out. And good to see a picture of my roomy for the 2013 Fat Quarterly Retreat in your pics too! love the buntings and the mini wall! Thanks for sharing your fun pics! You are certainly encouraging me to try to make it next year. :) Fun Fact: Your little scorpion friend is actually pretty common too. I had a bio teacher in college point out that these little guys are everywhere inside large buildings, but they're actually harmless to us and help by eating bugs. Oh how fun!!!! I love hearing about your Sewing Summit experience!! I'm determined to go next year and have my fingers super crossed that you can teach me to make a pouch, in a class or a hallway, either will be awesome! Love your wall of mini-quilts and the bunting is spectacular! Thank you for sharing and getting me even more excited for next year!